Windows Server 2008 R2 is the server edition of Windows 7, where both shares the same code base. 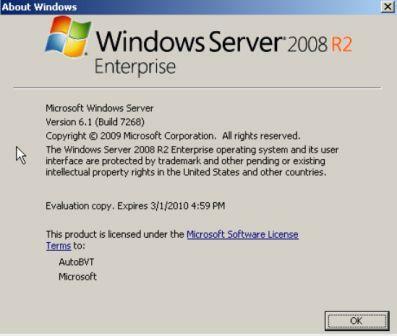 After Windows 7 Build 7264 is leaked, WZor.net has posted another build of Windows 7 Server, aka Windows Server 2008 R2, although it’s available for 64-bit (x64) edition only, and only available in VHD (Virtual Hard Disk) image format, which can be used to mount on virtual machine to run immediately without installation. Build 7268 is a pre-RTM and post-RC build, and thus no longer accepting neither Windows 7 Beta keys or Windows 7 RC keys. However, rearm Windows 7 works to extend free evaluation and no-activation period to 4 months, enough to wait for Windows 7 RTM to launch or leak.